Iaido (pronounced ee-eye-do) is the traditional Japanese martial art of swordsmanship. Iaido focuses on methods of drawing and cutting with the sword. There is no contact in Iaido - it is performed solo and helps develop mental discipline and physical skills through the practice and perfection of forms called kata, consisting of sequences of movements executed against one or multiple imagined opponents. These kata evolved from battlefield techniques of feudal Japan and were codified in the 16th century by Jinsuke Hayashizaki who is widely recognized as the founder of the art. 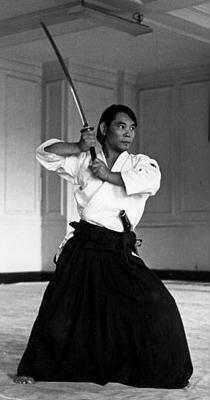 In a typical basic kata, the Iaido practitioner sits or stands quietly with full poise and in deep concentration. Suddenly the blade is drawn and in an uninterrupted single motion slices through the air. Silence and a pause filled with total awareness are the echo of the cut. Next, and in the mind of the practitioner, a hapless imaginary opponent falls lifeless, and his imaginary blood is shaken off the blade. The sword is then resheathed in a controlled manner, and calm returns. This flurry of activity takes just a few seconds to unfold, but reflects extensive practice	to master the basics, to grasp and incorporate fine details, to develop coordination, precision and power, to maintain balance both in stillness and in motion, to perfect the timing and flow of the forms while executing them gracefully yet without losing their lethal quality. The development of internal aspects such as concentration, focus, imagination and a calm spirit are direct byproducts resulting from the practice of the art. Iaido's true value reveals itself in the inner battle it promotes within the self to cut away all redundancies. Through the precise movements of the kata, the practitioner seeks to engage his entire being, to unify intention, action, and sword. It is through this unification that the sword is transformed from a simple implement into a tool for spiritual development. For this reason, more and more people turn to the demanding practice of Iaido. At Toronto Aikikai we study and practice the curriculum of the Muso Shinden Ryu style of Iaido as established by Mitsunari Kanai Shihan . Each Iaido class starts with warm up exercises that include a variety of drawing (nukitsuke), cutting (kiritsuke), cleaning (chiburi) and resheathing (notto) sword techniques. These are followed by group training where kata are demonstrated by the instructor and are performed together with the students. Next, students practice on their own under the instructor's supervision. Iaido classes are held on Tuesdays and Thursdays from 5:30 to 6:20 pm and on Saturdays from 9:30 to 10:30 am.